Facebook is rolling out a new feature to users that allow you to create live video feeds to put on your timeline. Here’s a look at using it on iOS. Some of the hottest new apps to come on the smartphone scene are Twitter’s Periscope and Meerkat; these apps let you live stream video to your followers. Twitter is even beginning to integrate Periscope live streams into the social network platform. For some, it’s more of a headache, since it will be one more thing that you have to avoid auto-loading in your timeline. 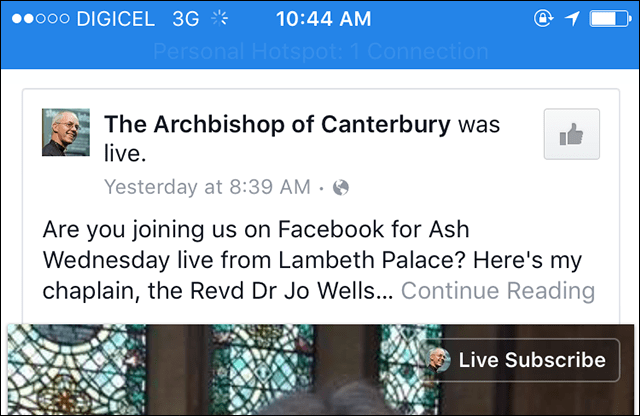 Facebook is jumping on this trend with their version of live streaming which was recently launched for iPhone and other iOS devices. Thankfully, my local cellular carrier provides subscribers with free access to Facebook, Twitter, and Instagram without affecting data use. I have had the opportunity to check out the feature for a few weeks and enjoy it. Facebook’s Mark Zuckerberg live streaming a video to followers. Live Streams can be published by verified Facebook users. If you follow celebrities and known public figures, you’ll be able to view live streams, and when they’re published, you get a notification. Facebook will display a ticker at the top indicating how far in progress the Live Video is and the number of current viewers. When you tap on it, immediately you can start watching the event; leave a reply, which provides interaction with the publisher, who can respond in real time. Publishers can keep videos available for later viewing. If you find the videos from the publisher interesting, you can click the floating Live Subscribe button. Facebook is slowly rolling out the new feature to accounts that are not verified. You can periodically check if the option is available to your account. To know if you have it, create a new post, and you’ll see a new tab for Live Video. Then you’ll be prompted to allow Facebook access to your camera by going to Settings > Facebook Settings and turning on access. Note: Live videos are not limited to iOS, you can view them using the Facebook app on Windows Phone and Android, and with your computer online, but creating one is limited to iPhone and iPad for now. For me personally, I could care less about the publishing part. The great benefit is finding live videos to watch. Many technology sites I follow on Facebook, provide on-demand product reviews of the latest gadgets. Not to mention, these are interactive so that you can get even more information than the standard recorded video review. 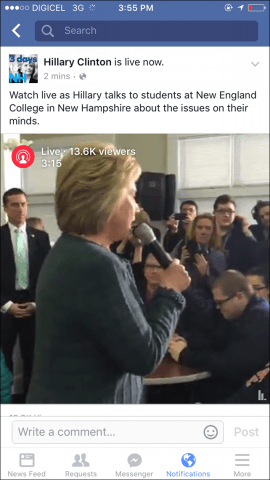 Also, with this being an election year in the U.S., popular news networks and candidates are using Live Video to reach voters. To view or to broadcast? Because just today alone I watched several live videos on my 4s. To broadcast, it’s not on my Facebook app yet but is on everyone else I know. How do I get started on viewing live broadcasts? I have an iphone6. Do I go to iTunes and get an app or do I start with FB? Do you know? thanks! I still don’t have the live button:( When will everyone get it??? I can watch, but not broadcast. I want to broadcast to my family that lives 4500 miles away. I got a Windows phone and I haven’t have the live button, When will I get it? I still don’t have it, they are slowly rolling it out. The sound quality isn’t very good on my iphone. Is there a microphone I need to use?? In order to live stream video for Facebook, you need to be connected via WiFi or 4G cellular; so how do you prevent an incoming phone call from interrupting your stream? I used to put my phone on “Airplane Mode” to prevent an incoming call from stopping my recordings when I didn’t need to be connected. But now with live streaming; how can you prevent this disruption? I have an iPhone 4s and could use to broadcast live on Facebook on my phone, now I can’t anymore, does anyone know why? What version of Facebook do you currently have? Cause I’ve figured out what you have to do, you have to go into your App Store and see if Facebook needs an update, update it then you should have the live feature back. Hi you all what version of Facebook do you currently have? Cause I’ve figured out what you have to do, you have to go into your App Store and see if Facebook needs an update, update it then you should have the live feature back. nope.. still don’t have it..
Ok, I’m sorry to hear that. Try uninstalling your Facebook then reinstalling it and see if you see the live icon then. Also, I forgot to ask what type of phone do you have? Also make sure that the access to your camera is turned on. Go to settings in your phone then Facebook settings and turn it on if it’s off. been though everything and checked all my settings.. I had it for a bit and then one day I didn’t anymore… I have an iPhone..
Ok, I’m sorry to hear that. Can you screenshot what you are seeing when you try to update your status? Because I had the same problem that you are having now, had the live icon then it disappeared now it’s back after updating my Facebook to version 57.0. Also make sure your software is up to date. Do you have an iPhone 4,5,or 6? Got my iPhone 6s plus updated and FB but still there’s no FB live option on my status bar…what should I do?? I had it before. After updating to version 58 it disapper! having same problem also… i do not have the live icon. Is there a way to share vudeibshit live from Facebook to YouTube or to my videos on iPhone so that I may transfer to YouTube?